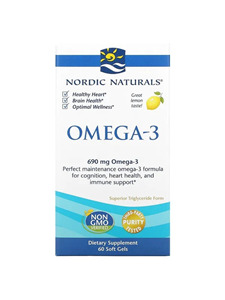 Each serving of Nordic Naturals Omega-3 provides approximately 690 mg of important omega-3 fatty acids, generously fulfilling the daily recommendations by international experts of a minimum of 500 mg per day. Omega-3 fatty acids are essential for good nutrition and overall wellness. Since the body cannot produce these fats, they must be consumed through diet or supplementation. Every batch of Nordic Naturals fish oils is third-party tested for environmental toxins, including heavy metals, dioxins, and PCBs. All fish oils used in Nordic Naturals products surpass the strictest international standards for purity and freshness. Certificates of Analysis available upon request.